The federal Workforce Investment and Innovation Act (WIOA) supports the integration of education and training (IET) and career pathways. This guide emerged from in-depth conversations about how eight adult education programs around the country have been successfully integrating IET. 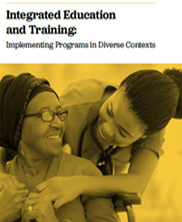 These programs offer a wide array of approaches both in who the adult education programs partner with (Career and Technical Education departments within a college, the vocational technical high school, WIOA authorized training providers, or in-house technical training instructors) and how they collaborate in those partnerships to develop an integrated curriculum. Program profiles highlight the importance of designing programming that fits the particular context of a local community – both its opportunities and constraints. World Education, Inc., 2017.